Highlighting the greatest moments in drumming history. Hands down, this is one of the greatest moments in drumming history. This legendary performance features Dave Weckl, Steve Gadd, and Vinnie Colaiuta all trading drum solos with each other. In the video below, I’ve transcribed the entire solo section note-for-note so that you can follow along! VINNIE COLAIUTA - LIVE AT THE BAKED POTATO - FULL DRUM TRANSCRIPTION! Vinnie Colaiuta is one of the greatest drummers to ever play the instrument. 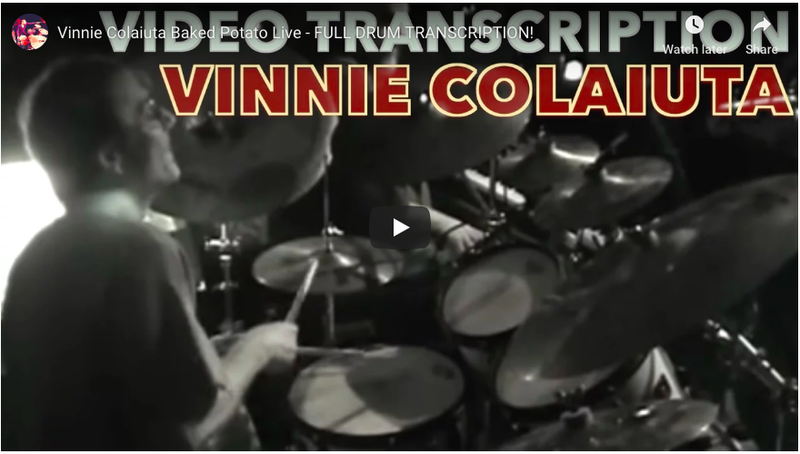 In the video below, you'll see my full transcription of Vinnie's drumming on the tune "Goe." Pace yourself while learning Vinnie's vocabulary ... there's a LIFETIME of things to study from this performance! Want to know when new Masters Of Drumming content is released?